The best of the best in Shopping Centre marketing gathered to recognise the achievements and efforts of the country’s top marketing campaigns for the year in late October 2013. The awards were hosted by the Property Council NSW and The Shopping Centre Council of Australia for the first time in their eight year history. 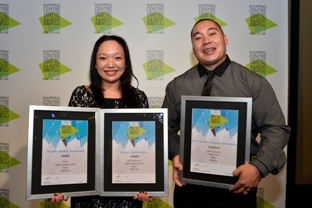 The 2013 Shopping Centre Marketing Awards recognises five major marketing categories for shopping centres, broken down by centre size. Broadway Shopping Centre started Mirvac’s winning streak by taking out the first award for the night with Broadway’s ‘Be You’ campaign being crowned the winner for the Big Guns Branding/Positioning category. This was followed up with another win for the Broadway team in the Big Guns - Digital Initiative category for ‘Be a Christmas Star’. The recent redevelopment and resurrection of Hinkler Central after extensive flooding saw the hard work of the team with Hinkler named runners up in the Little/Mini Guns Development/Redevelopment category for their campaign ‘We’re here for you Bundy’. To finish off a successful night Broadway’s ‘Be You’ campaign was named runner up for campaign of the year.